Right next to the exhibit on the first floor dedicated to America’s transportation systems is the National Museum of American History‘s latest exhibit: On the Water. As much as transportation over land has changed the United States, the maritime elements of our economy has done the same. Divided into seven slices of time, some of which overlap, the exhibit focuses on the coastal and riverfront parts of the United States from 1450 through to the present. Read on for a preview. The beautiful exhibit covers myriad artifacts and stories that the Smithsonian curators have cultivated into a clear and amazing exhibit focused on our shores. From the fishing and whaling communities, through to riverfront America, with a special focus on our immigrant experiences crossing over into the US, the exhibit covers 8,500 square feet. It’ll take you an hour or so to just walk through all the space, and you could lose several in there to just all the models and miniature ships that are contained therein. The sections on the response of the merchant marine in World War I and World War II are spectacular, as well as the various pieces from the era of the grand luxury steamship. The exhibit is a permanent one, so there’s no hurry. But do get to see this one. 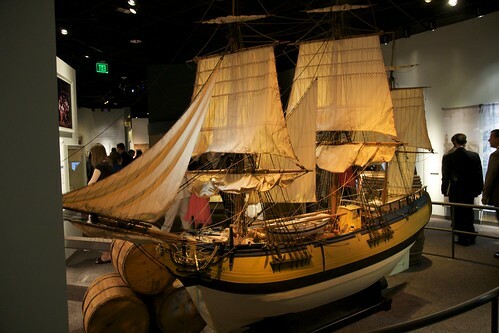 It’s amazing how much of this nation was built with the assistance of our commercial sailors, and this exhibit is a celebration of that, even tinged though it is with regret concerning what some early maritime resources were used for. 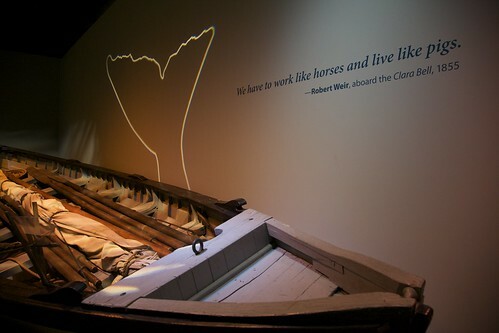 Whaling, slaving, over-fishing, these are part of the history of the maritime portions of the US, and the exhibit doesn’t shy away from them, including them in significant portions. It’s a great “warts and all” exhibit, and absolutely worth seeing. nice find, tom. I will put this on my list.